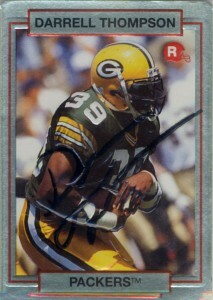 The Green Bay Packers (at least during the 1990s) were a really good organization with TTM requests. Darrell Thompson is basically a Great Lakes legend where he went to school locally in Rochester, Minnesota and then at college at Minnesota playing for the Golden Gophers where he’d lead the team in rushing in 1986, 1989 and 1990. Thompson would finish with 40 rushing touchdowns and rank 4th on the college’s all time offensive yardage list with 4,518 yards rushing and 337 yards receiving, easily running away with the school’s rushing record. At 6 feet and 210 pounds, Thompson was an imposing force. 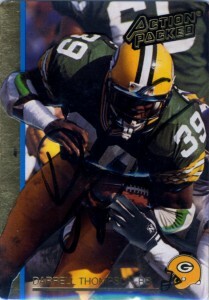 The Green Bay Packers would make him the 19th pick of the 1990 draft and immediately pencil Darrell in at fullback. He would come in off the bench his rookie season while he was learning the system and do some spot duty at kick returning- even returning one for a touchdown. His second season would have him lead the Packers anemic rushing attack, chipping in 471 yards starting in 13 games. Thompson would suffer a series of setbacks from injuries starting only 4 games in 1992, but would rebound nicely in 1993 rushing for a career high 654 yards and 3 touchdowns for the Pack- but buried in the depth chart in 1994 Darrell and after only 8 games Thompson’s season would be over- and so would his career. He would work with at risk children and first time offenders in a Twin Cities project called Bolder Options which he expanded his involvement in after retirement. Thompson would also become a regular with the Minnesota Gophers athletic department and has gone into broadcasting, working radio for the Golden Gopher network.